Bombardier is Justin Trudeau’s true priority, that much is now clear. Sure, since coming to office Trudeau and his Liberals have tried to claim that they have other priorities such as reconciliation with First Nations, helping the middle-class and those working hard to join it, or ensuring that the relationship with the United States remains stable. But these last few weeks have shown us that Bombardier trumps all. The latest proof is that the needs of the men and women in the military are being put behind the needs of Bombardier. Just 10 months ago, Defence Minister Harjit Sajjan announced that Canada would buy 18 Super Hornet fighter jets from Boeing to make up for the “capability gap” the Royal Canadian Air Force was facing without new planes. Suddenly, we don’t need those planes as soon as possible and not because the needs of the Air Force have changed but because the needs of Bombardier have changed. On Tuesday, the US Commerce Department sided with Boeing over claims that Bombardier was selling planes in the US “at absurdly low prices”, something they were able to do thanks to subsidies from Canadian taxpayers. The response from the Trudeau government was quick, no more fighter jets. “The Government of Canada cannot treat as a trusted partner a company which is attacking our aerospace sector,” Foreign Affairs Minister Chrystia Freeland said within hours of the decision from Washington. Can the military treat as a trusted partner a government that puts the interests of one company ahead of the safety of our men and women in uniform? Canada’s fleet of CF18 fighter jets is aging and will soon be obsolete if not replaced. The Liberals campaigned against buying the F-35 and said they would look at other, more affordable options, such as the Super Hornet. And that was the plan until Boeing acted against the real priority of this government, Bombardier. The military is taking a back seat to protecting a privately-owned company that is tightly controlled, and badly run, by one very wealthy Montreal family. Trudeau will take this to a trade war status with the US if he has to, and run it as a Canada vs. the United States issue rather than two companies fighting it out. “We won’t do business with a company that’s busy trying to sue us and trying to put our aerospace workers out of business,” Trudeau said last week. Of course, Boeing isn’t suing Canada; it lodged a trade dispute against a single, privately owned company. While it’s understandable for Trudeau, or any prime minister, to go to bat for Canadian industry, putting one company ahead of the entire country is not. Trudeau already showed his preference for Bombardier over ordinary taxpayers when he gave the company $372 million in federal aid that executives said they didn’t need. Trudeau showed a preference for Bombardier by being silent on the executives taking big bonuses with that subsidy money while attacking small business owners for not paying enough in taxes. Now he is showing his preference for Bombardier over our Air Force pilots by telling them they can fly old planes while he stands up for what really matters – his friends. Boeing is not attacking Canada’s aerospace industry, it is attacking Justin Trudeau and the Liberal penchant for unfairly subsidizing private industry. This could not have happened without the help of this government and previous governments. They have only themselves to blame. 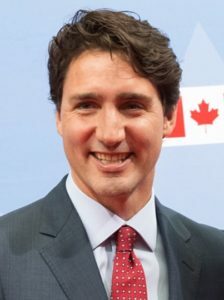 I hate Trudeau as much as the next person but he is doing what is necessary in the Boeing dispute. The US government just applied a 220% tariff on Bombardier jets – this is an act of economic warfare – Trump is treating Canada like North Korea. Bombardier is Canada’s most important manufacturer – one of the few we have left. The government must do all it can to protect this company. It would be insane for Canada to purchase F18’s from Boeing after what Boeing has done to Bombardier. If we need new fighter jets we can get them from Europe in fact I think Canada should scrap the F35 and buy Fighters from Europe to be assembled in Canada. Drop Super Hornet, go to France for a better fighter aircraft, will provide jobs in Canada will allow for development of Canadian aerospace industry. And what is the name of the outstanding French fighter aircraft? Trudeau & Couillard will spend whatever taxpayers’ money it takes to show the world that there is no taxpayers’ money supporting Bombardier. Ironically, its the one piece of information from the Liberals transparent enough that Canadians all over actually know about. Here is the deal.IfTrudeau and Couillard keep protecting Bombardier jobs why doesn’t Quebec approve the pipeline to protect Western Canada jobs.It’s only fair! Yes get new fighter planes but Boeing is not the only supplier. Remember the Avro Arrow? If a previous government had not pulled the rug out from under the Canadian aircraft industry in the past maybe we could be building our own fighter plane and selling it to others.